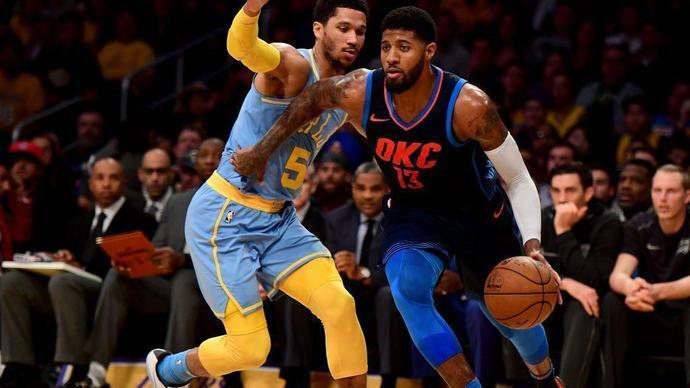 Paul George didn't request a trade from the Pacers. He merely informed them he'd leave in free agency and told people he'd sign with the Lakers, leaving it up to Indiana what to do about it. The Pacers traded him to Oklahoma City, where George found a long-term home. He re-signed with the Thunder this summer. Even while with the Thunder, George spoke openly about the appeal of Los Angeles. Despite not meeting with the Lakers in free agency, he still called them tempting. He's mostly just confirming what we already believed. Remember, the Lakers could have traded for George last year. Instead, they banked on getting him without surrendering assets, and that gambit failed. Importantly, they still lured LeBron James, but they're still searching for a second star. This ought to reopen questions about whether the Lakers erred by not trading for Kawhi Leonard. Leonard reportedly has interest in Los Angeles (though maybe more in the Clippers), but the Lakers watched the Spurs trade him to the Raptors. Will Leonard similarly fall for Toronto and spurn his hometown team? It'd be a mistake to assume Leonard will follow the path of George, who's a completely different person. But it'd also be a mistake not to evaluate the precedent set by George and learn from it.